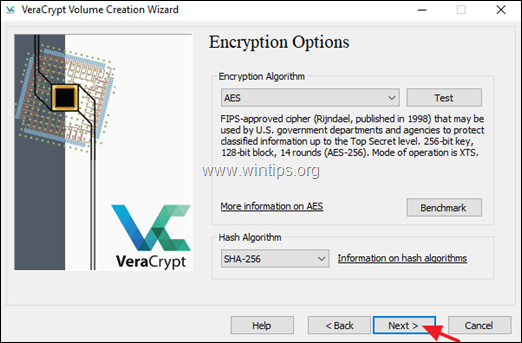 This tutorial contains detailed instructions on how to encrypt the operating system drive C: on Windows by using the VeraCrypt free encryption program. 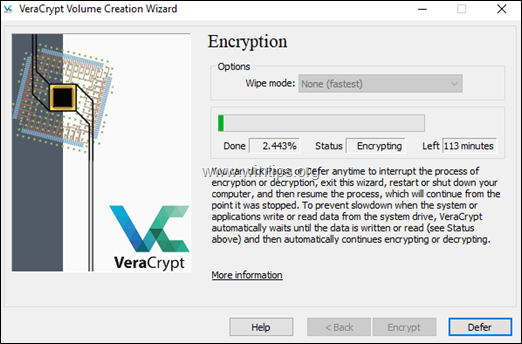 VeraCrypt is a free open source disk encryption software which is available for Windows (all versions), Mac OSX and Linux. How to Backup and Restore your Personal Files with Windows Backup. How to Backup Personal Files with SyncBack (Free) Backup Utility. Related article: How to Encrypt your PC with BitLocker in Windows 10 Pro & Enterprise. 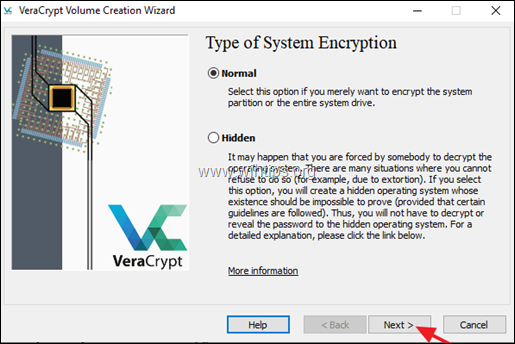 How to Encrypt your Windows PC with VeraCrypt. * Note: Always install VeraCrypt with local administrative privileges. 2. 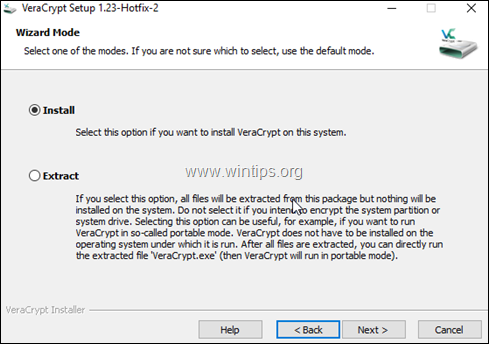 When the installation is completed, launch VeraCrypt and from the System menu, select Encrypt System Partition/Drive. 3. At type of System Encryption options, leave Normal and click Next. 1. Encrypting the whole drive is the best option, because it protects your PC with a password before it starts (pre-boot authentication). 2. 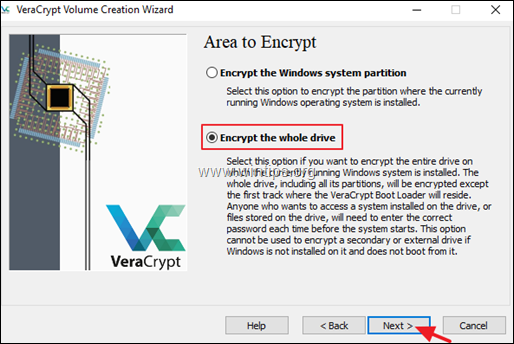 If the "Encrypt the whole drive' option is not available (greyed out), then you have to disable the "Secure Boot" in BIOS before running the VeraCrypt. 5. Select No at Encryption of Host Protected Area options and click Next to continue. 6. 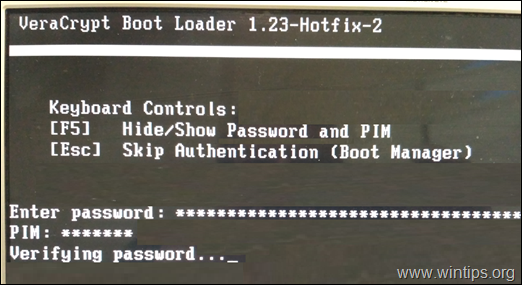 At Number of Operating Systems options, select Single-boot, unless you have installed multiple operating systems (Multi-boot) and click Next to continue. 7. Leave the default Encryption Options (AES / SHA-256) and click Next. 8. Now type a strong password* and click Next to continue. * Note: A very strong password must consisting of 20 or more characters and it must contain upper and lower case letters, numbers, special symbols, etc.. TIP: Check the "Display Password" checkbox to verify what you typing. 9. 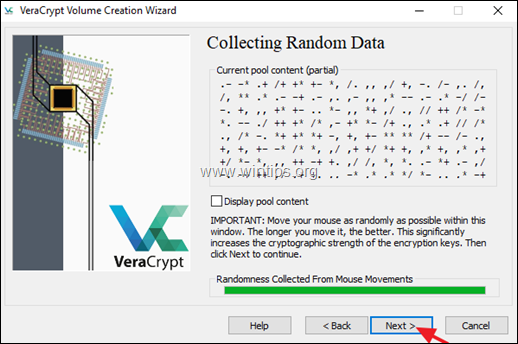 At Collecting Random Data window, move your mouse as randomly as possible within the window to increase the cryptographic strength. When the 'Randomness' bar becomes green press Next to continue. 10. At Keys Generated window, click Next. 11. 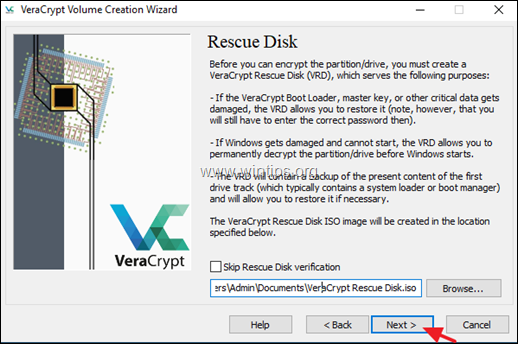 At Rescue Disk window, note the path for the VeraCrypt Rescue Disk ISO image and click Next if you wish to create the Rescue Disk immediately, or select the Skip Rescue Disk verification checkbox to create the Rescue disk later. 1. 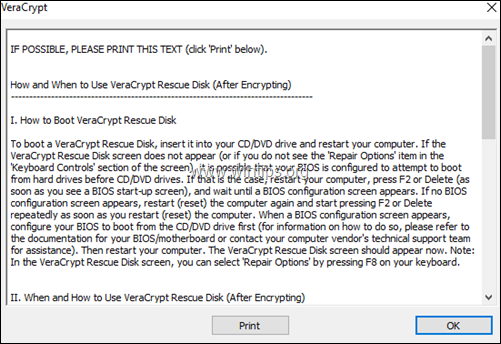 For prevention purposes, its better to create immediately the Rescue disk and also to have a copy of the VeraCrypt Rescue Disk ISO image file to another computer. 2. 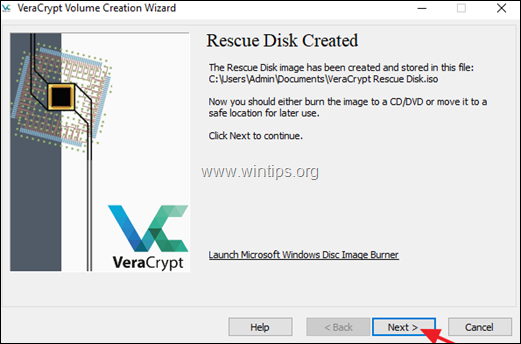 If you want to create a VeraCrypt USB rescue disk, then you can use the Rufus utility to burn the VeraCrypt Rescue Disk ISO image to USB. 1. 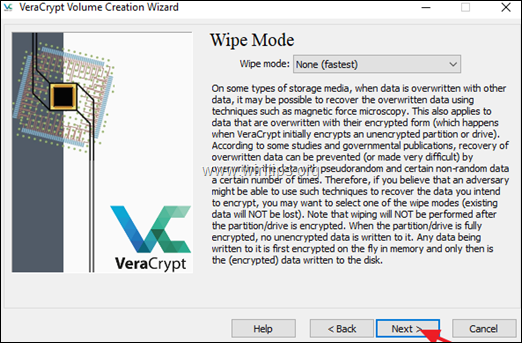 If the VeraCrypt Boot Loader, master key or other critical data gets damaged. 2. If Windows gets damaged and you cannot start the system. 12. 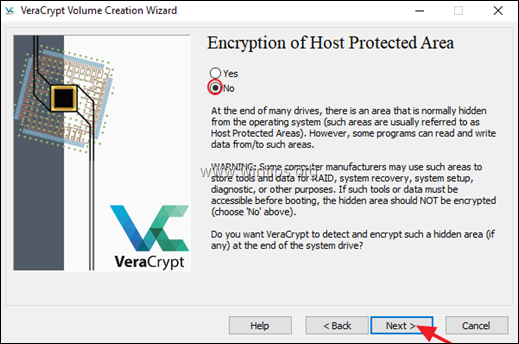 At next, VeraCrypt will prompt you to create immediately a VeraCrypt Rescue CD or DVD. Click OK to continue. 13. 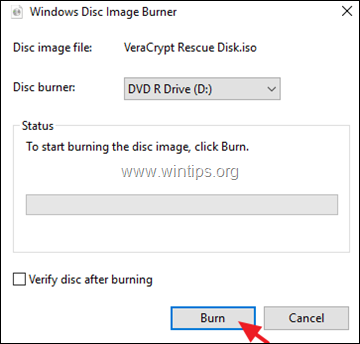 Now, place an empty CD or DVD on the disc burner and click the Burn button to create the Vera Crypt Rescue disk or click Cancel if you want to create the rescue disk later or if don't own a disc burner. 14. When the Recue Disk is created click Next. 15. At the Wipe Mode screen click Next. 16. At System Encryption Pretest screen, click the Test button in order to verify that everything works correctly. 17. Now carefully read the 'Important Notes' (or better print them) to be ready if something goes wrong and click OK.
18. Then click Yes to restart your computer, in order to start the System Encryption Pretest. 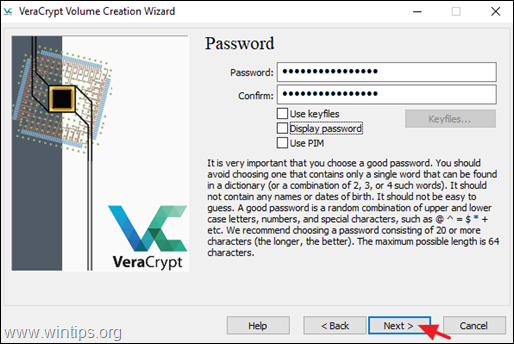 * Note: If you repeatedly enter the correct password but VeraCrypt says that the password is incorrect), do not panic (the drive is not encrypted yet). 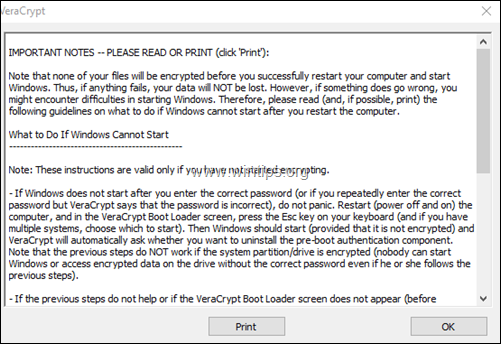 Just restart (power off and on) the computer and in the VeraCrypt Boot Loader screen, press the Esc key on your keyboard and Windows will start. 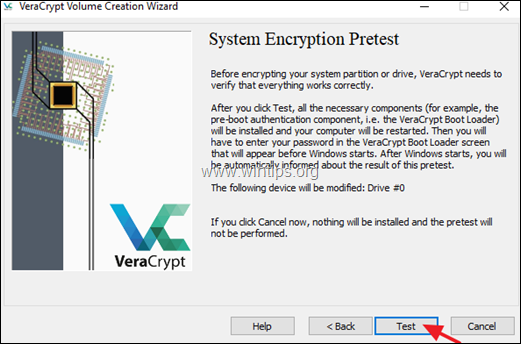 Then when asked by VeraCrypt, uninstall the pre-boot authentication component. 20. After booting to Windows, VeraCrypt should inform you that the pretest has been successfully completed. Read carefully the warning on the screen and when done press Encrypt to start the encryption process. System -> Resume Interrupted process: if you want to resume the encryption process. System -> Permanently Decrypt System Partition/Drive if you want to terminate the encryption process. * Suggestion: Do not forget to always have a recent backup of your data on a separate device (e.g. on an external USB drive), stored in a safe place. 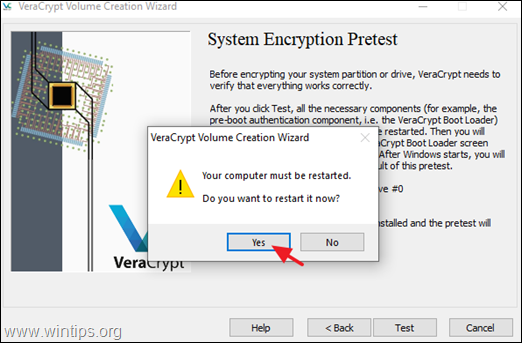 If your VeraCrypt protected computer cannot start normally, then boot your computer from the VeraCrypt rescue disk (CD/DVD or USB), and then press the F8 key to access the repair options. Then press the corresponding number key to start the repair action you want, according of the problem. 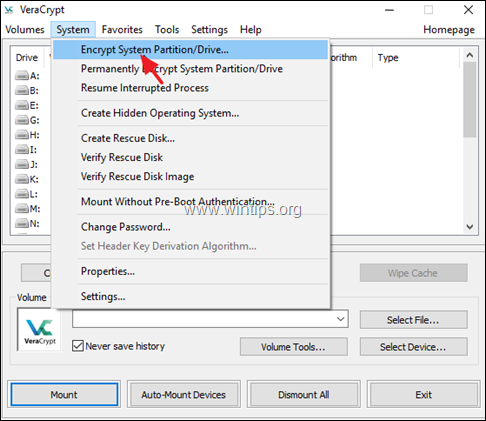 Permanently decrypt system partition/drive: Use this option if Windows cannot start (after entering your password), in order to permanently decrypt the partition/drive. 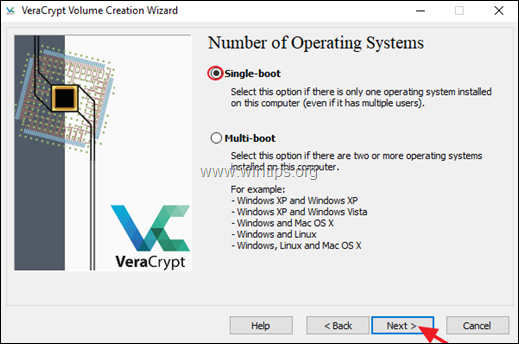 Restore Vera Crypt Boot loader: Use this option if the VeraCrypt Boot Loader screen does not appear on the screen after you start your computer (or if Windows does not boot), to restore the boot loader and to regain access to your encrypted system and data. Restore key data (volume header): Use this option to restore the master key or other critical data, if you repeatedly enter the correct password but VeraCrypt says that the password is incorrect. « FIX: Windows 10 Black Screen with Cursor issue, after Update (Solved)	» How to Schedule Google Backup and Sync.